Dytran introduces a new range of rugged sensors designed to withstand harsh, high-frequency, high energy environments that are otherwise known to damage sensors. 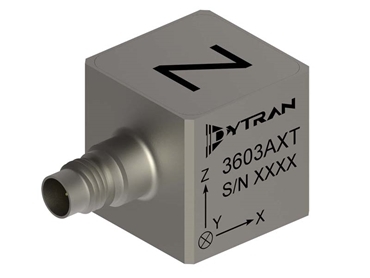 The new Dytran 3603AXT series of triaxial IEPE accelerometers incorporates a mechanically and electrically filtered design that allows the sensor to operate in an environment with high–frequency excitation without causing amplifier saturation and signal over–range. Key features of the Dytran 3603AXT series include sense elements internally isolated from the outer case and enclosed by a Faraday shield for good noise immunity; latest planar shear sensing technology as well as TEDS functionality; industry standard 1/4–28 4–pin radial connector and 10–32 stud mounting capabilities, and available with a sensitivity range of 1–10 mV/g; sensors hermetically sealed for reliable operation in high humidity and dirty environments; case isolated to avoid EMI/ground loop interference; and lightweight titanium housing. The Dytran 3603AXT series rugged sensors find application in measuring vibration after a high g event; engine NVH - cylinder head vibration testing; product drop testing; metal-to-metal impact high frequency application; and general purpose triaxial vibration measurements. 3603A1T - mV/g sensitivity, 15000g range, 4–pin industry standard 1/4–28 radial connector, 10–32 stud mount, 30 grams, –51°C to +121°C operation. 3603A2T - 5 mV/g sensitivity, 1000g range, 4–pin industry standard 1/4–28 radial connector, 10–32 stud mount, 30 grams –51°C to +121°C operation. 3603A3T - 10 mV/g sensitivity, 500g range, 4–pin industry standard 1/4–28 radial connector, 10–32 stud mount, 30 grams, –51°C to +121°C operation. Dytran Instruments, Inc. is a leading manufacturer of piezoelectric and DC MEMS accelerometers, force and pressure transducers and associated electronics. Metromatics is the distributor in Australia and New Zealand for Dytran Instruments, Inc.
For further information, please visit the Metromatics website, or call (07) 3868-4255.